April Fools is a long-standing American tradition. A similar day is celebrated on different dates around the world. But what happens when something serious happens on April First? Would your automatic reaction be to call it a prank? Couldn’t that be dangerous? That’s what happened for Elisa Castellanos, who got a call from her son-in-law, saying someone had crashed a car into a part of her home. She thought it was a prank at first, but it turned out to be true. Josefa Fernandez, 51, lost control of her Kia SUV at SW 137th Avenue and 47th Street. He hit a concrete block wall of a townhouse patio head on, smashing the front of her SUV and scattering blocks into the yard on the other side. Luckily, police arrived right away after the crash, which neighbors reported sounded like a giant explosion. 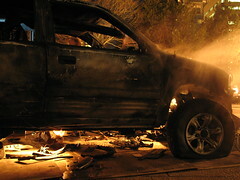 They found the SUV’s front was completely smashed to the windshield and the dash in flames. When they noticed the car was on fire, they didn’t hesitate to pull Fernandez out. They set her gently on the ground and called in medical help. Meanwhile, a neighbor used the hose that was in the crashed-into yard to put the fire out. Fernandez sustained several injuries, including some fractures. It is unknown what caused the crash. Fernandez worked in the medical profession, as is evidenced by the nurse’s scrubs she was wearing when she crashed. She was taken to the hospital, but she was awake and alert at the time. If you’ve been in a car accident recently, regardless of the circumstances, you’ll need talented and experienced legal representation to make sure you get the help and support you need to recover. Don’t just trust that your insurance will stand up for your rights. Miami Car Accident Lawyers are ready and willing to fight for you. Call now for a free consultation.